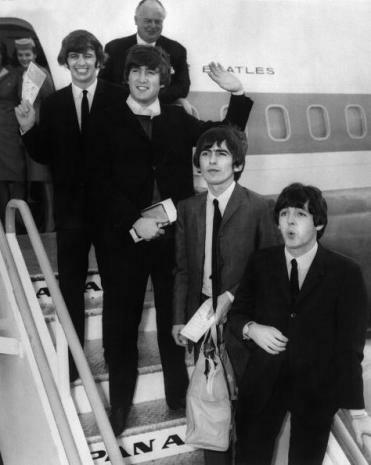 The Beatles arriving in London on Clipper Beatles after their triumphant inaugural tour of the United States. “The mannered manager of the English band whose name few had previously heard had a message for all those present in the conference room at JFK’s International Arrivals Building (IAB, now Terminal 4). Speaking to mostly seasoned representatives of Pan American Airways, the Port Authority, and the New York Police Department, Brian Epstein could not have found an audience less likely to believe that they were weeks from experiencing a crowd unlike anything they had seen before. “Mary Ann Trainor had joined Pan Am’s public relations department after moving to New York from Michigan in 1963. She sat across the table from Epstein in the hours-long planning meeting, during which the Beatles’ movements from aircraft to an on-site press conference and through curbside departure were plotted in detail. “Rizzo observed that they looked like little boys’ but she admired ‘how neatly combed they were, well scrubbed and with mod suits. . . . [she] observed that when asked if they had any special requests from VIP services, the four had none. ‘You would want to have a son like that,’ was how Rizzo summed up her impression of how the Fab Four handled the almost unimaginable situation unfolding in front of them. Unfortunately, Webber could not interview Mr. Barkle as he passed away in San Francisco on August 7, 2013. However, in his obituary from the New York Times (published 8/24/13) it was noted that he had been “responsible for accompanying VIP’s and dignitaries from around the world” during his many years at Pan Am. “One can scarcely locate a single photo taken of the Beatles on the airfield in which Pan Am’s aircraft and its recognizable personnel are not clearly visible. Then once inside the IAB, the Beatles’ press conference was conducted in front of a wall decorated with the classic Pan Am globes visible on all sides. Even when walking, the Beatles can be seen toting clearly labeled Pan Am bags they would continue to use for the remainder of the trip; photos and news reels shot later on the trip showed the Beatles carrying newly purchased records and other bounty from America in these same bags. Webber’s full article can be seen here. As Pan Am provided the air transportation for the Beatles and their entourage, it could fairly be said that the airline was in fact a sponsor of their trip to the United States. In all likelihood, however, at least in the airline industry at the time, providing free transportation was very likely not considered “sponsorship” in the sense it is today. And it would hardly make sense if the historic trip was called “The Pan Am/Beatles Official Inaugural Flight to the United States”. Times have changed! It should be noted, however, that since Pan Am’s breakthrough, other airlines began getting the message, starting with plugs during credits following TV shows where “travel arrangements provided by such and such airline” can be heard. Murphy’s father, a former Marine pilot, according to the article, was often used to pilot celebrities on Pan Am flights. Murphy was quoted as saying, “He was a very personable man. He had a great sense of humor and really enjoyed schmoozing with the passengers. When working, my father considered the plane as his living room and felt it was part of his responsibility to entertain the passengers.” This is probably the reason he was selected to fly the Beatles to the United States. The full story about Helen Shea Murphy on MassLive.com can be seen here. Finally, on 7 February 2014, the Port of Authority of New York & New Jersey hosted an event commemorating the arrival of the Beatles at the TWA Flight Center at Kennedy Airport. The Lord Mayor Gary Millar and Deputy Mayor Wendy Simon of Liverpool, England were in attendance as well as the band “The Cavern Beatles” from Liverpool, who performed for the attendees. A commemorative plaque marking the arrival of the Beatles on Pan Am will be dedicated and installed at Kennedy Airport and a replica of the plaque was unveiled at this celebration. In attendance were members of World Wing’s International, a philanthropic group of former Pan Am flight attendants. Gillian L’Eplattenier who worked flight 101 and whose recollections were featured in the previous post and Mike Webber’s article, was honored by the City of Liverpool with a gift for her role on the Beatles’ first flight to America. Photographs from that event are here. In sum, the Beatles inaugural trip to the United States was a huge coup for Pan Am. Not only did the “Blue Ball” springboard into world recognition, the creative use of sponsorship to gain brand recognition and product placement had its genesis. Pan Am crafted this technique to ensure its market presence but it was not until decades later that it developed into an art by the world’s airlines. I recall transiting MIA when they were due or had just left and the excitement was there! Between us kids, I also recall being sloshed in FRA and standing by a post in a nightclub so that I wouldn’t fall down listening to a take off on the Beatles, trying to figure out on earth was going on. Of course, there were three of us that night and a bunch of Germans were following us from bar to bar. I am very touched by any material related to PANA AM – The Sentimental Airlines of all Times.